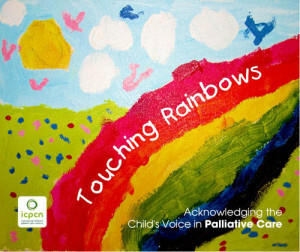 Through this book, ‘Touching Rainbows: Acknowledging the Child’s Voice in Palliative Care’ we have the privilege of hearing the voices of some of the many children whose lives, and those of their families, have been affected by life-threatening conditions. The children tell their stories with honesty and openness, through stories, poems and pictures. Children and their families from across the world share their experiences, either from the child themselves or from those who love them, such as their parents or brother and sister. The stories, often told in the child’s own language and translated into English, are an inspiration to us all. It is hoped they will touch and enrich the lives of many, encourage those travelling a similar path, and instill a sense of courage and joy, despite the many challenges and heartaches.